Dimocarpus. (From Greek dimorphos, two-formed, and Karpos, fruit.) Sapinidaceae. Five species of trees or shrubs to 40m or more. Leaves Pinnate, rarely unifoliate, pinnae to 7, spirally arranged, opposite to alternate, stalked, glabrous above, hairy or finely papillose beneath, entire or serrate to dentate petiole swollen, hollowed at base. Inflorescence often terminal, sparsely branched, flowers 5-7 per scattered cyme, unisexual; bracts lanceolate to subulate, to 4mm; calyx cupular, lobes equal, imbricate, ovate; petals to 5, oblanceolate, entire, pubescent; disc complete, slightly 5-lobed, densely hairy; stamens 8; ovary sessile, cordate, hairy and warty; style as long as 2-30-chambered ovary. Fruit globose to ellipsoid, warty, smooth or densely long-spiny, inside smooth, purple or brown when ripe; seeds globose, black-brown, arillate. SE Asia to Australia. Z10. Grown primarily for its edible fruit, with sweet, translucent-white flesh and aromatic flavour, Dimocarpus longan is also an attractive ornamental tree for frost-free warm temperate sub-tropical climates, with a spreading habit and glossy pinnate leaves. Slightly hardier and less exacting than Litchi, it tolerates light frosts and wind, and grows rapidly on a range of soils, given abundant moisture in the growing season, and some shade from the strongest sun. Propagate from seed, by layering or grafting; seedlings take some time to come into fruit. Cultivation otherwise as for Litchi, (find Lychee via the home page). 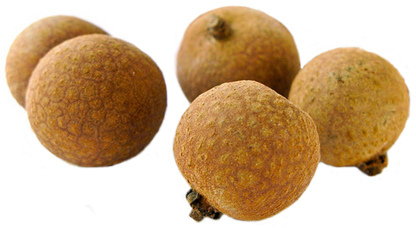 LONGAN; LUNGEN. Tree to 40m, sometimes buttressed. Pinnae to 45 x 10cm in 2-4 pairs, entire, obtuse, glabrous beneath; petioles 1-20cm. Inflorescence 8-40cm in upper leaf axils, cymes 3-5-flowered; pedicel 1-4mm; flowers yellow-white, calyx smooth. Fruit globose, 2.5cm diameter, almost smooth, yellow-brown, arillate pulp white, sweet. Summer. India. ‘Isau’: sweet, juicy, melon flavour. ‘Kakus’: sweet, musky flavour. 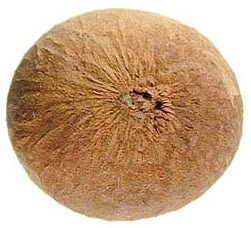 ‘Kohala’: large fruit, sweet, spicy; top commercial cultivar.